Fall is among us and I feel like a little kid who is seeing leaves change color for the first time. I really don't think I could be any more excited to experience Autumn in all its glory, so naturally I'm going a little nuts-o with the Fall decorating and baking this year. I recently took to my kitchen once again in attempts to make a good, baked (GF) pumpkin doughnut, but I wanted something a little different than a frosting or cinnamon sugar topping, and the next logical step after frosting and sugar was of course cream cheese. 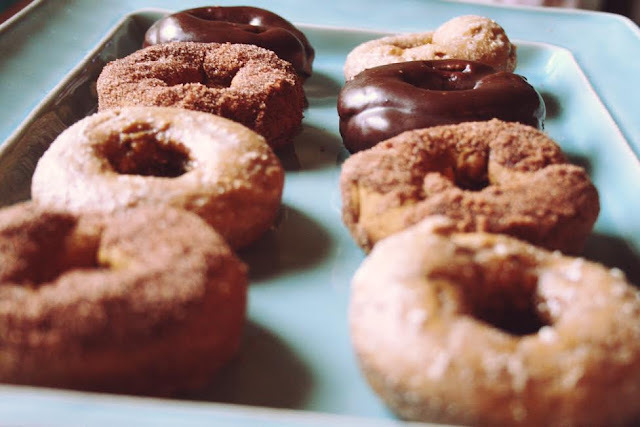 I ended up making a variety of doughnuts -- a few with a chocolate and cinnamon sugar topping, but the verdict was the cream cheese glazed took the cake. 1) Preheat oven to 350 degrees and spray 2 doughnut pans with nonstick spray. 2) In a large bowl, mix together flour, baking powder, baking soda, salt and pumpkin pie spice. Set aside. 3) In a separate bowl, mix together brown and granulated sugar, melted butter, eggs, vanilla extract and pumpkin puree. 5) Fill piping bag (or gallon size storage bag and cut corner) with half of the batter and fill doughnut tins 3/4 of the way. 6) Bake for 10 minutes or until cooked through. 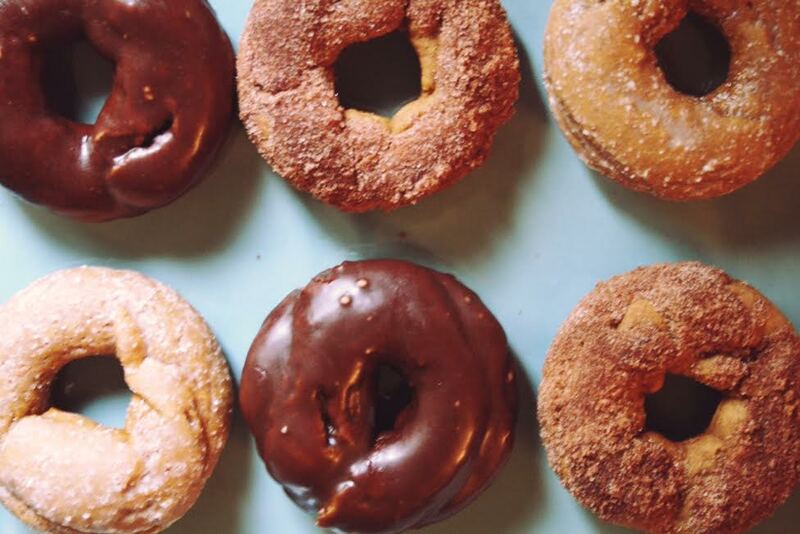 When doughnuts are cool, dunk 'em in the glaze and let sit.